News from around the school! We held a Green day for habitat for Humanity. This was held in conjunction with St Patrick’s Day and all the children were allowed to leave their uniform at home and wear green instead for the day. We have two past pupils heading to Africa to work for this charity. Our Seachtain na Gaeltacht went well incorporating a Ceolchoirm or concert and Tráth na gCeist or quiz. We also held an Assembly as Gaeilge by 6th Class. They told the story of the Gruffallo in Irish. This was a fun week for everyone. Alan Nolan, an author came to visit the school. He spoke to 3rd-6th Classes. He was excellent and humorous with his stories and showed them how to draw some of his characters. They were all given paper to try using a step by step approach. I think they surprised themselves at their own achievements. Our boys’ hockey team got into the finals of their league. This was also a great achievement. Unfortunately, they did not win but their excellent sportsmanship, good behaviour and excellent play was noted. 5th and 6th classes got a bus over to Three Rock to support them. Friendship Week was held in April. We tend to buddy up a senior class with a younger class to have activities and learn from each other. The classes really look forward to these events. Young and old learning from each other. Always a good thing! 1st class held Spring Show. Their parents cane to see them. This was fun and led by our music teacher, Naomi Clarkson and their teacher Alison Gallagher. It was so lovely to hear them sing and perform. We certainly can feel as though Spring has sprung! The weather has been very mild and the flowers and bulbs are blooming. Two egrets have moved back onto our grounds and we welcome them. They are obviously nesting nearby and don’t mind the noise of the children at all. Whilst out playing we can see them walk around on the grass. Our window boxes are looking well along with many bulbs which are planted in unusual items like old boots and watering cans. Well done 3rd Class! It is with great sadness we bid Canon Fred Appelbe farewell in March. We held an evening in Old Conna Golf Club with all staff, Board of Management, PTA, Ancillary staff and others associated with the school through Music, Games etc. Naomi Clarkson and her troop played songs for us and entertained us for the evening. 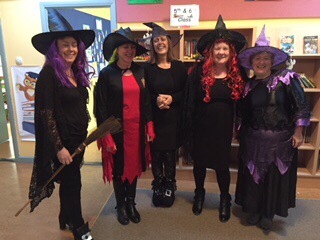 Along with this we had a lovely assembly where the children sang songs, read poems and limericks and we even had a ventriloquist from 2nd Class! It was very entertaining and very fitting as we will truly miss his good humour here at Rathmichael. Four of our children from 6th Class attended the annual Credit Union quiz held in the Killiney Castle Hotel. Fun was had by all. Many thanks to the parents who attended with them. The Credit Union continue to be very supportive of our school and have indeed given us a tablet which we can raffle. We intend to use this in our school quiz. We had a Dance Day where the children got to dance to music for a period of the day in our hall. 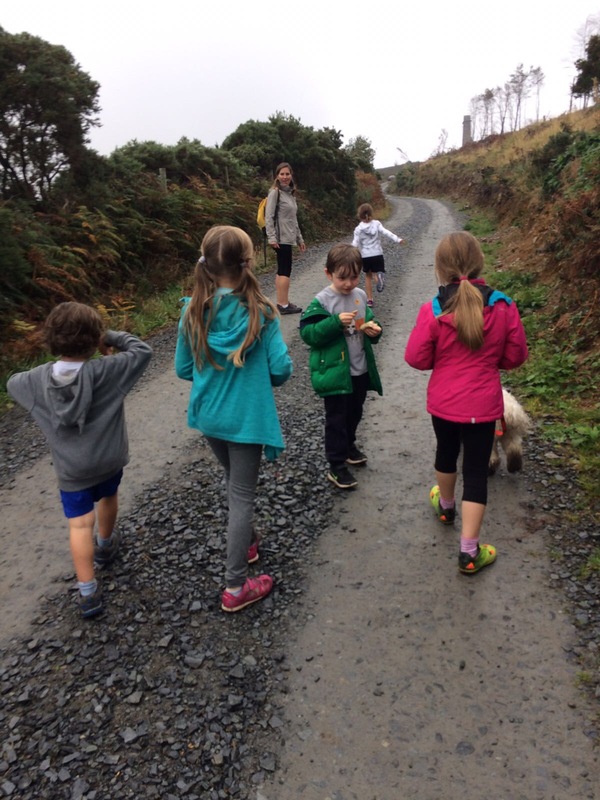 We aim to keep our children as active as we can in various different ways. This year we are going for our Active Flag so activity is especially paramount. We are running around Europe also. Each class takes time out during the day to run around our Astro pitch. The distance is accounted for and each class is running to a different place in Europe. Running and dancing is extremely good for the children’s wellbeing. Well-being and mindfulness are important to us this year as we are doing our school self-evaluation in this area. It gives the children time away from studies, time to regroup themselves and allows the body to let off steam in an appropriate manner. Canon Fred Appelbe retires on 28th February and will be a huge loss to the community. We held an evening for PTA members, Board of Management, Staff, Ancillary Staff etc. in the Old Conna Golf club on 7th February. The Legato Singers sang for us in the background and it was a lovely event. The Legato Singers play such lovely music and are available for events, weddings and funerals and can be reached at 0879539348 and thelegatosingers@gmail.com and on this website www.legatosingers.comWe were able to acknowledge all of Fred’s amazing efforts over the years both in Rathmichael Church and in the school. He will be sorely missed by one and all. We held an Art and Wine evening. This is always a lovely evening where the children have their work displayed in the hall and the parents come and share a glass of wine with other parents. It is a very social event. This year we chose Marine life as our theme. We are working towards our Marine Life Green School Flag at present so it linked in very well. The children put in a lot of work and the display was superb. Great thanks must go to the teachers who guided the children and the PTA who provided the refreshments on the evening. The whole school attended ‘Beauty and the Beast’ pantomime at the Mill theatre. This was just fun and was enjoyed by all the classes and all the ages, including the teachers! We had an activity for our Active Flag. This involved dancing to Christmas Music. Classes came down to the hall for a certain period of time to dance and be active in a fun way. They were allowed to wear Christmas jumpers, hats or red and green colours. Any excuse to be active in an enjoyable way. This year we had a very enthusiastic set of parents who put an advent calendar together for the school. This involved a lot of time and effort. There were doors to open throughout the run up to Christmas. Each class had an opportunity to open a door and there was great excitement with the surprises within. Many thanks to a parent who sponsored it all. We will look forward to next year in the hope that it will all happen again!!!!! Our annual Art and Wine took place where all the children displayed their artwork and parents came to view and enjoy a glass of wine socially with other parents. It was a very enjoyable event and one which is looked forward to every year. Well done to the PTA for their hard work and indeed the teachers who put on an amazing display. The theme this year was ‘Marine Life’. This coincides with the theme for our next Green Flag. There’s always something we are working on. In aid of World Diabetes Day we had a fundraiser. For this we held a Crazy Hair Day. It was great fun. A lovely display of hair dos are on view in the corridor of the school. Many thanks to Shirley and Keith Garland for all their help with this. In October we held our Harvest Festival in the school. 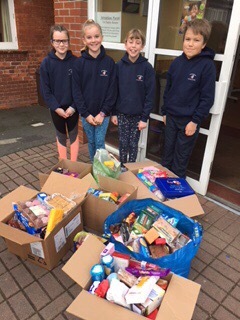 Canon Fred Appelbe attended the assembly and each child brought in food items including biscuits, coffee, tea, cake, tins and packets of various shapes and sizes and sweets. These were all loaded up into my car and along with three children from 1stclass were brought to SOFA which is the Shankill Old Folks Association. The children spoke with the elderly people there. They were so very grateful for all the gifts we brought. We had an author visit in connection with the sinking of the Leinster mail boat 100 years ago. Carmel UíCheallaigh wrote a book for children on this topic called, ‘Leinster, the forgotten tragedy’. This was a simplified version of the tragedy. Much has been done in this area on this event and it was good for the children to understand it. They were given an opportunity to ask questions. Our Team Hope colleague, Carol Hennessy visited the school to tell us about the shoe box charity. She told the children what happened to their shoeboxes last year with wonderful stories of her visits to Belarus. We collected boxes which were brought in after midterm. The children are encouraged to put in unused items they may have in their own bedrooms which another child would love to have. We have found that the children love to get involved in this particular event. Canon Fred Appelbe and myself attended the school service in Christ Church cathedral with three children. The service was excellent and talked about homelessness. 3rd Class went on their annual visit to Airfield which is a city farm. This is very educational and they are brought around the house, the animals and the grounds. It was a fun day for all. Dress up day was probably the highlight of October, having a bake sale on the same day. Best part being the last day before mid term! Our school planted vegetables in the raised beds in our school garden. It was great to see them growing and we were able to collect them up for a display in September. Our Church and School Fete was great fun and attended by both the school and indeed the whole community. The atmosphere was very positive and I believe everyone who attended felt it was well worthwhile. A break badly needed following this but we will be raring to go again next year. We had a visit from Carmel Kelly who wrote the book ‘Leinster the Forgotten Tragedy’. This is a children’s book which tells of the sinking of the RMS Leinster. This would be regarded as Ireland’s greatest maritime disaster. One hundred years later. There has been a lot about this especially in Dunlaoghaire Library and we wanted to make sure the children knew what it was all about. We had a very successful Active Week this year. The children love taking part in all the activities which are timetabled. This year we had cricket, Irish dancing, Pilates, Tag rugby, Sports for all, Stretch and Grow along with morning exercises for everyone. It was a fun way to end our school term and kept us all busy and active which was its main goal. Various school tours took place to many venues. May and June are good times to go as the weather is better. However, this year we cannot complain about the weather! Our Sports Day was run by Southside School Sports who have taken over our after school games and help out with PE in school. This ran very smoothly and introduced the Tug of War which was good fun. The whole school take part regardless of ability and I believe the parents enjoy it too. Good news. We received an honours certificate for Tidy Towns this year. We make it our business to keep the school clean and in good condition. Each class gets involved in this process. Gillian Bourne, as person in charge of Green Schools and the Active Flag, gets everyone to get involved and applies for this annually. Our 6th Class whom we have just lost as they have moved on to their secondary schools, were given an envelope in Junior Infants by their teacher Ms. Hayley Appelbe. This was to be kept until they were leaving school. They contained pictures poems and memorabilia form their time at the start of Primary School. Ms. Appelbe returned in June to watch them open their envelopes. It was very moving and a lot of fun. The bed between our Astro pitch and the top playground was weeded, cleared and replanted by 6th class. It is now full of beautiful flowers and thriving. The flowers planted will remain from year to year so hopefully we will continue to see a splash of colour each year. Many thanks to our caretaker Gary for all his help. 5th Class took a day out of school to clean our local beach. This was very good for the children to see all the waste that is needlessly thrown about. Many bags were filled and these were collected by Dunlaoghaire / Rathdown County Council. If everyone were to pick up one piece of waste each day our environment would become a better place. As part of our Mí na Gaeilge, or month of Irish, the children made books which were entered into a competition, Scríobhleabhar Awards. We had various types of books from paired books, individual books to class books. I attended the awards in Tallaght with 16 children. They were presented with certificates, medals and pencil cases. Well done to Ms McMurdock for all her hard work and the encouragement she gave us all. The Setanta Book Fair took place I our school on 23rd April for a week. This was run by Ms Armstrong. I saw a lot of eagerness and enthusiasm from parents and pupils who wanted to buy books. A percentage of the books sold goes back into the school in the form of books. This is our year for concentrating on books with our new library so new stock is always welcome. The Fair made over €1700 which was a great success. Thanks to all who got involved especially parents who regularly helped. We have a lovely Tree of Hope which was put up by Gillian Bourne who is in charge of our Green Schools Programme. Every child had a hope to share with the school. A lovely sight and worth a look. Two teams were entered into the Spar FAI Primary School’s 5 a side soccer competition. The qualifiers took place in March and the boys’ team played in atrocious weather conditions, winning their section and being narrowly beaten on penalties in the decider. The girls’ team, pictured with coach, Garry Zambra, won its qualifying matches and went through to the Dublin Finals. The girls won their section and were narrowly beaten for a place in the Leinster finals – this was a brilliant achievement. Well done to both teams for all their efforts – we are all very proud of them for the way they played and the exemplary manner in which they represented the school. Thanks also to Garry for giving his time and expertise so generously. The school football A team, which is mixed, has one more match to play in its league and is in the quarter-final of the cup. The B team were narrowly beaten in the Junior cup. Various shows were held led by both Naomi Clarkson and the teachers , our music teacher. She is a great addition to our school encouraging talents which may be hidden. 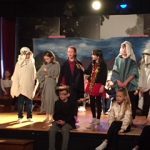 5th and 6th class performed songs from musicals, 3rd class performed songs from Disney. These were put on after school in the early evening to facilitate parents. They achieve a great sence of self confidence and it builds on their self esteem. Many soloists appeared which were astounding. The shows were performed for the school as well thus encouraging some of the younger children in the future. Seachtain na Gaeilge turned into Mí na Gaeilge. This was led by Aoife McMurdock our 1st Class teacher. She is a Gaelgóir and as such encourages our teachers and pupils. She gives of her time at lunch to teach Irish Dancing for our concert. The school created their own Irish books at each class level which were judged outside of the school. They have an Irish vocabulary wall displayed in the concourse. Mé Fein books are also on display. A concert was held where each class performed either a dance, song or poem in Irish for the rest of the school. Individuals did Irish dancing, played the tin whistle and piano. Go raibh maith agat Mrs McMurdock. Niall de Burca came in to read to the children. He is an Irish author and entertained the children and staff with his antics. It was great fun and gave the children a real love for the English language. He left us with CDs of his stories and I have had many requests for him to return! The PTA held a cake sale for all which was a great fundraiser for the school. Our healthy eating policy went out the window as everyone indulged and had some fun. Many thanks PTA for all your hard work. It is laways worthwhile. Rathmichael had great fun with Pancake Day this year. The PTA pulled out all the stops and flipped pancakes all morning to everyone’s delight. Each child brought in €2 and the proceeds went towards Crumlin Hospital. This is part of our Global Citizenship Flag where we work towards helping others in the wider community. Our new nets went up around the Astro Turf. We have been afraid that one day one of our many balls was going to cause an accident on the Dublin Road. Health and Safety is always our first priority. We are relieved to have them there. Many thanks must go to the PTA and their fundraising for paying for these. Natasha Stanley is going to Romania with her school to build houses. We helped her raise money towards this trip by holding a RED day on Valentine’s Day. Children could wear red or hearts into school instead of their uniform. She will return to an assembly and tell us all about her trip. Natasha supplied us all with biscuits which were delicious. Many thanks Natasha. We here at Rathmichael wish her the very best with her venture. Children these days have so many opportunities. They are very lucky to be able to go abroad so easily. I hope they appreciate the help their parents give them to avail of all of these. Our new PE coaches from Southside School Sports started with us in February and we are delighted with the energy and enthusiasm they bring with them. I would like to take this opportunity to thank June Lawless and her team for all their work with Afterschool Games over the years. June has been invaluable, reliable and so very capable. We will miss her in Rathmichael and have really appreciated all the work she has done for the school. I have a feeling she will still be seen knitting and sewing with the teachers!! There was a ceremony held on 7th March to open the new pitches on Stonebridge Road. This has taken a long time and the schools will be extremely grateful to have them to play their matches. The area was originally zoned for business and after many meetings it was re-zoned for Parks. Well done to all involved for achieving so much. The Credit Union ran an art competition. Ellie Mcdonald won first prize in this winning a family pass to the Zoological gardens. They had previously run an art competition in conjunction with Shankill Traders. In this we had three four winners, Poppy Miller, Max Lawless, Olivia Carroll and Ellie Mcdonald. Poppy won a camera at this time. 6th Class entered a quiz which the Credit Union sponsored for schools. This was enjoyed by all. Our M3 money saving club is also run by the Credit Union and is very popular. Well done Core Credit Union on all you do for the schools It is very much appreciated. Getting involved with the local community is important in our school. Indeed it is part of our Global Citizenship Flag. We held our own handwriting competition in the school to promote neatness, good punctuation and clarity. We hold this twice a year and it has proved to be very popular throughout the school. Children who are making great strides with their writing are also encouraged as we have prizes for each class for most improved. This year we held an Adult Quiz as a fund raiser in Shankill Tennis Club. This was well attended and great fun. Niall Carty, a parent, went to enormous trouble putting questions together and unfortunately for him has a job for the next4/5 years!! Well done to the PTA for the refreshments and organisation involved. Getting people to attend fundraisers can be a very difficult task, however usually everyone has a good time and certainly the school benefits each time. Thank you all my amazing volunteers. Every month we collect money for Fields of Life to sponsor two children, Caleb and Rebekah, for their education in Uganda. Previously we have sponsored children and they have gone on to become an electrical engineer and a lawyer. This is part of our Global Citizenship Flag which we are trying to attain this year. A group from Uganda came touring to Ireland and Scotland to promote Fields of Life and to get sponsorship. They performed for the school and spoke about the children we support and have supported. It was a lovely experience for the school showing the children what our collections are all about and making it real for them. Hopefully we will continue to do this for a long time. John Scottus Secondary School and ourselves teamed up for a project this year. The Transition Year students came and played Volleyball and Soccer with our 5th, 6th 2nd and 3rd classes. This was a great experience for them showing responsibility and respect for the different age groups. We were tremendously lucky with the weather and the children looked forward to it every week. I would like to thank John Scottus School for this opportunity and hope to liaise with them again in further projects. Don Briggs, author of ‘The Boy who wanted a Dragon’ came to visit the school with his illustrator. He has been to the school before. This time he promoted his new book ‘The Return of the Dragon’. This he sold at the school for €10 and all proceeds went to Temple Street Hospital. We have recently renovated our library and are trying to have authors in and to promote it with the children. We hope to have a few more over the next few terms. We held our annual Art and Wine. The theme this year was ‘Fairytales’ which was in keeping with our new library. The children displayed wonderful artwork and there was a lovely atmosphere on the night. Well done PTA and teachers on the evening. 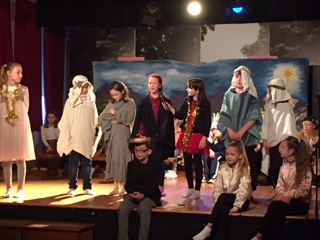 Drama and music are a huge part of Rathmichael School. Both 4th Class and the Infant Classes put on shows for the parents and the school. They were of a very high standard and great thanks must go to the staff and Naomi, our Music Teacher for this. They appear to get better and better each year. We have had a rather active month. We are working on our Global Citizenship Flag. Towards this we collected shoeboxes for Team Hope. This has become an annual event. A wonderful display of over 150 shoeboxes arrived into school on 8th Nov. They were covered in Christmas Paper and families in the school had gone to great lengths to fill them over the midterm break. It is lovely to see the children thinking of others at this Christmastime and also to see the great enjoyment and satisfaction it brings to everyone. Thinking of our own local community we collected items of non-perishable foods for Harvest this year. We delivered this to the local association SOFA (Shankill Old Folks association). Each member went home armed with a bag of goodies from the school. The produce also helps with occasions and festivities held in the centre over the next few months. Again a time of giving, remembering those worse off than ourselves. We at Rathmichael are particularly lucky and are in a positon to help others and so we should when we can. A good thing for children to learn. We held a Dress Up Day at Halloween which was a lot of fun. Staff and children entered into the spirit of the occasion. 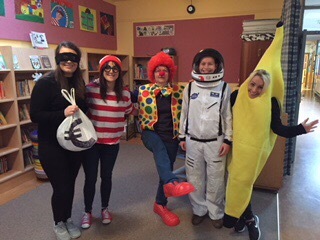 The PTA held a bake sale, also dressed up, joining us with our theme. Sometimes it’s just good to feel good and have some fun! Some of our children entered the handwriting competition for the Community game on behalf of Shankill earlier in the summer. Ruby Geelon, Charlie Geelon and Daniel Murphy won medals for their respective categories in the Dublin Finals. They were sent forward to represent Dublin in the National Finals at the end of August. Ruby Geelon took the silver medal for all Ireland. We are very proud of them all. 5th Class entered a competition run by the local Gardaí. This was to celebrate and promote Social Inclusion. We are delighted that Alannah Jackson was a winner and was presented with a medal in Dunlaoghaire Garda Station. Well done Alannah! 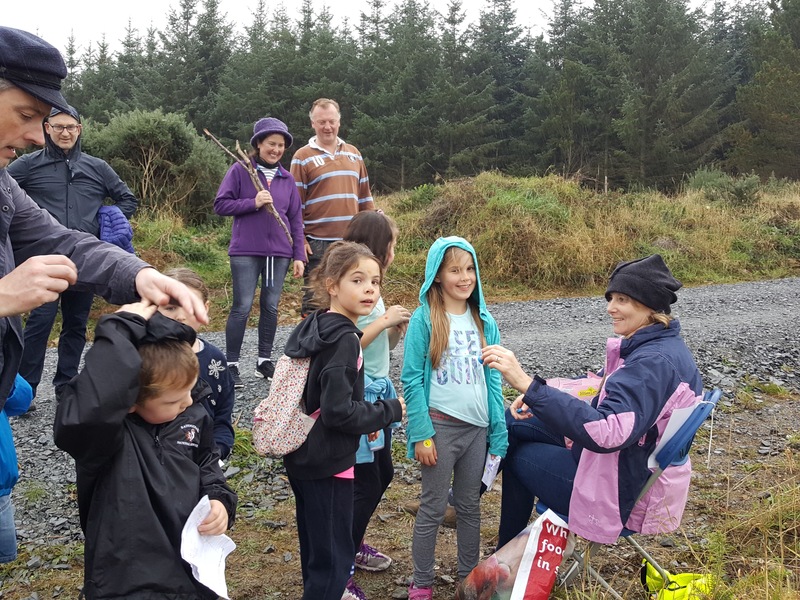 The Sponsored Walk took place on Sunday 8th October in Carrickgolligan Wood. It really is a lovely event and the children love running around the well supervised course. Well done PTA for your superb organisation. Lovely to see so much support and happy faces. At the Rathmichael Church annual Harvest our junior choir sang beautifully. The school enjoys being part of this occasion. Coffee and a sale of goods were held in aid of Christian aid following this service. Welcome back to a new school year. Teachers and pupils have all changed classes and a new positive energy is in the school. It is a time for us all to settle. Thank you for everyone’s support on this matter. I am pleased to announce that our football team of 2016/2017 won both the school’s League and the Cup. A huge effort goes into our after school games by our coaches and leaders and we must remember that most of this happens due to their commitment. Well done all those who took part over the year. Even if you didn’t play on the day you were part of the journey. A hockey match took place on our pitch between the parents and 6th class. This was great fun and enjoyed by all. I’m not sure who enjoyed it the most. There was a lot of competitiveness. Amazing to see the skills we have both with the parents and the children. I even saw one or two teachers out there giving their all! It was fun. The most loved event of the year for the children took place in June. That was the Summer Dance. The children arrived all glammed up and ready to dance. Sam Stott, a previous youth leader with us, led the music and he was kept on his toes by the children. The dancing never stopped and cool pops were a necessity. Well done to the PTA for organising and supervising this. Sport’s day took place and as usual went smoothly with a barbeque organised again by our PTA. We had great weather and were well supported by our parents. Our annual Rathmichael Fete took place with numbers well up above normal. The good weather brought everyone out including many we haven’t seen for a long time. Let’s hope they make it a tradition for the future. Well done to the organisers. A fabulous social occasion all of Shankill look forward to. Now to 2017/2018. Look out for all our news!